This is one of the blogger challenges that I skipped a few weeks ago. Cardamom was ridiculously expensive at the grocery, and I just couldn’t quite bring myself to buy it that week. But, this week I managed to find a smaller and more reasonably priced container. 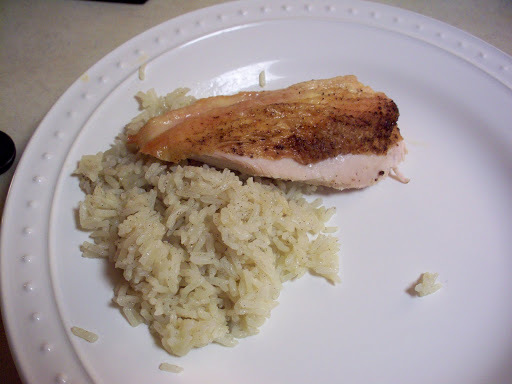 I didn’t feel like doing something sweet (I still have muffins to make), so I decided to try Cardamom Chicken and Rice. I found the recipe on the Food and Wine website. It was pretty easy. The recipe actually called for chicken legs, but I couldn’t find any leg/thighs still attached. So instead, I got some bone-in chicken breast halves. I rubbed the chicken with some canola oil and seasoned it with cardamom, salt, and pepper. It roasted on 375 for about 50 minutes I think. In the meantime, I had to work on the rice. I needed 2 1/4 cups chicken broth for 1 1/2 cups of rice, but I forgot broth at the store and certainly didn’t have time to make my own. I did have some chicken bouillon though, and so I made about 2 cups of that and added another 1//4 cup of water (it seemed a bit strong/salty). I sauteed some shallots in oil (the recipe called for onions, but I thought shallots would be nicer, and I was totally right). Then, I stirred the shallots around in the oil/shallot mixture until all the rice was coated, added the broth and about a teaspoon of cardamom, and brought to a boil. Like really any rice, once it’s at a boil, you cover and simmer for 20 minutes. Let it stand for 5, then fluff it and serve. It was so good! I was very proud of having used cardamom in both dishes. Travis didn’t like the rice much, but he did enjoy the chicken so it all worked out. This entry was posted in Uncategorized on August 31, 2010 by michelejames. I wasn’t sure what to do for the ingredient this week, tomatoes. I love tomatoes, but especially in the summer, I usually just eat them marinated and raw. So good. But I wanted to try something different, and I remembered that in the Lady and Sons Savannah Country Cookbook, there is a recipe for tomato pie. It’s actually really easy. 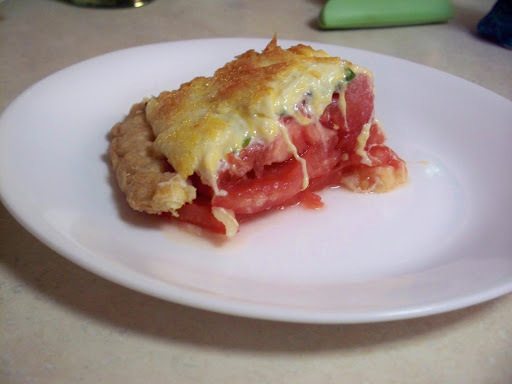 Prebake a pie crust, layer 4 peeled and sliced tomatoes, about 10 chopped basil leaves, and some chopped green onion. Top with a mixture of shredded cheddar and mozzarella mixed with mayonnaise. I think I could have used slightly more cheese or slightly less mayo, I’m not sure which. But, the pie was delicious. I also learned a ridiculously easy way to peel tomatoes. It was craziness. This entry was posted in Uncategorized on August 26, 2010 by michelejames. My dad came out to visit LA this weekend, so I did not finish the blogger challenge for last week. I’m planning to do coffee and maybe even cardamom this week! 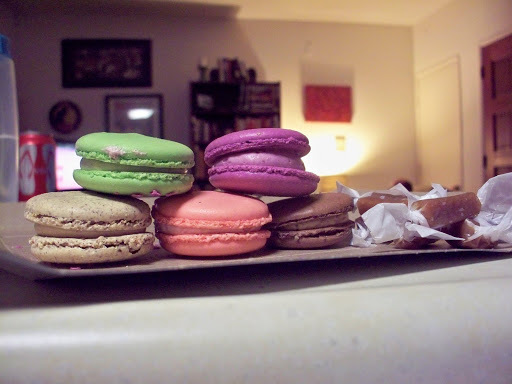 In the meantime, here are some beautiful macarons from Europane Bakery in Pasadena and some sea salt caramels from Little Flower Candy Company. They’re all really quite delicious. This entry was posted in Uncategorized on August 16, 2010 by michelejames. The secret ingredient this week is yogurt. I don’t like yogurt at all, but I felt confident that I could find ways to use it that would be delicious. I was right. I’ve been thinking for a while about using yogurt in baking, and I’ve been very curious as to whether or not this could in any way be successful. I actually talked to someone at work about it earlier this week, and they said they hadn’t had any luck with this, because they found the final product too tangy. I wondered if greek yogurt could possibly help this, since I’ve noticed it has less of that distinctive yogurt tanginess. So, I tried these double chocolate brownies. I get the recipe out of Food Network Magazine. Maybe it’s the double chocolate, but they are So. Good. 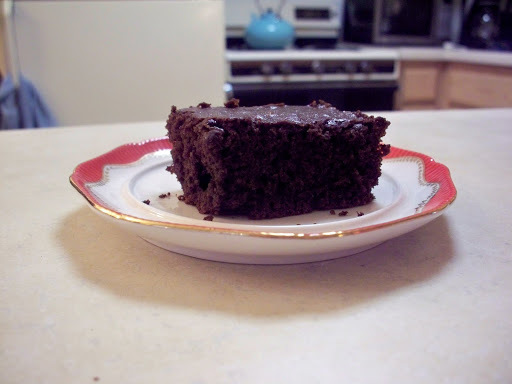 Chocolatey, moist.. just lovely. Travis even likes them, but I didn’t tell him that they have yogurt in them. Shh, it’s a secret. The recipe also calls for whole grain pastry flour, but being sort of drowsy at the grocery, I accidentally bought whole wheat flour. No worries though, some quick internet research told me that I could use 1/2 cup whole wheat flour and 1/2 cup cake flour. If you didn’t have cake flour on hand like I do (I have a very well stocked pantry, in spite of the lack of cardamom), you could use the full whole wheat flour, your final product would just be denser. Instructions: Preheat oven to 350. Coat a 9 by 13 baking dish with cooking spray. Melt the chocolate and butter in a heatproof bowl set over a saucepan of barely simmering water, stirring occasionally. Do not let the bottom of the bowl touch the water. Whisk the flour, cocoa, salt, and baking soda in a medium bowl. In a large bowl, whisk the eggs and brown sugar until smooth, then add the yogurt, oil, and vanilla, and whisk to combine. Whisk in the melted chocolate mixture until blended. Add the dry ingredients and mix until just moistened. Spread the batter in the prepared pan and sprinkle with walnuts, if desired. Bake for 20 to 25 minutes, or until a toothpick inserted in the center comes out with a few moist crumbs. Cool completely in the pan on a rack before slicing. This entry was posted in Uncategorized on August 9, 2010 by michelejames. Last weekend, I ate the most amazing thing. 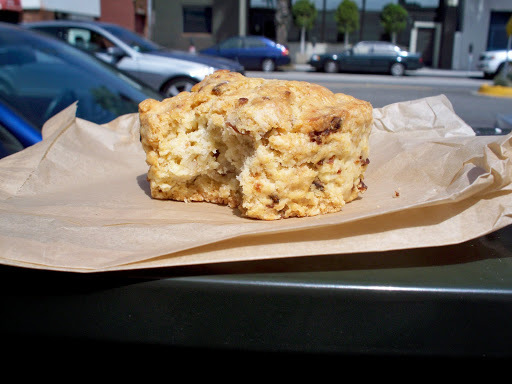 It is a maple bacon biscuit from Huckleberry Cafe and Bakery in Santa Monica. It was really crumbly and delicious, with bacon pieces and this lovely maple glaze on top. Oh, man. There’s really not much else to say. It’s just good stuff. It was a little tough to eat while walking down the street, being super crumbly and all. Salty + mapley + bready = perfection. I didn’t make the blogger challenge this week. We’ll just have to call it a fail and move on I guess. The ingredient was cardamom. I found some recipes online that I was quite excited about, but at the grocery I couldn’t find any cardamom less than $11, and I just couldn’t bring myself to go through with the purchase. However, I did get a new phone yesterday! 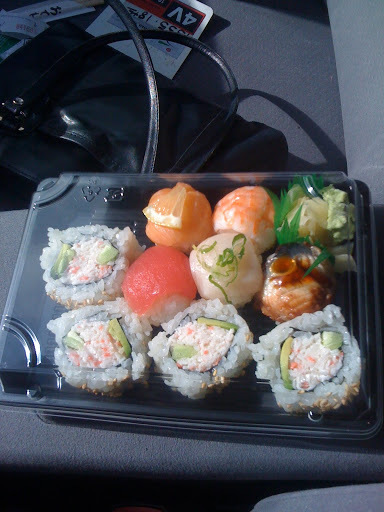 And in the process of going through my old phone, I found some delicious looking food picture that I had never posted. So, I decided to do a food truck round up with a few of my favorites. The Border Grill truck is amazing. These tacos are sooo good, particularly the potato and the fish. It’s funny, the third taco shown here is pork. Pork is almost always my favorite, but not in this case. I’ve also tried the carne asada since then, but I’m still fish and potato all the way. Not together, although that might be interesting. The fish taco (on the far right) is a crispy fish with chipotle honey and a creamy salsa fresca. It’s one of the best things I’ve ever eaten. 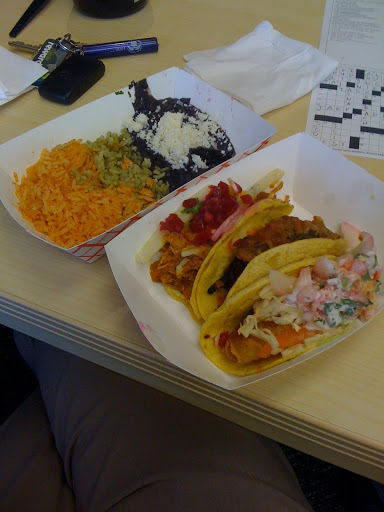 The potato rajas taco (center I think) is roasted potatoes, chiles, mexican cheeses, and pickled onion. They both have amazing texture. The fish is crispy, the potato is soft and all the ingredients sort of melt together. Hmm, this is actually making me quite hungry. You can also see the rice and beans side. It was alright. On that particular day, my red rice was sort of hard. The green rice and the beans were pretty tasty though. This is a good truck as well, but this appetizer is my favorite. Their entrees and sandwiches are pretty good, but generally I will just get these for a snack. 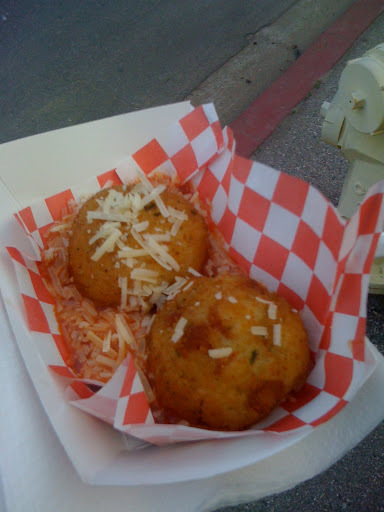 These are arancini, or fried Italian rice balls. Italian salame, parmesan cheese, and parsley with a mozzarella core. Deep fried. Usually they put a bit more cheese on top and serve it in a really nice marinara sauce. Not quite enough for lunch on its own, but it makes a delicious (if probably unhealthy) snack. I know the idea of sushi from a truck can be a bit scary. But come on, it’s not like they don’t have a refrigerator! This truck advertises a ‘real sushi man!’ on the side of their truck. And you can see him through the window, making sushi. He looks very serious, the truck looks very clean, and I would definitely recommend this to anyone. This entry was posted in Uncategorized on August 1, 2010 by michelejames.